Zion Cabin offers accommodation in South Lake Tahoe 3.6 km from Washoe Meadows State Park and 4.3 km from South Tahoe Ice Arena. 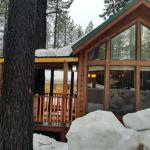 The property features mountain views and is 6 km from Heavenly Ski Resort and 6 km from Tahoe Queen. The holiday home has 2 bedrooms a living room a fully equipped kitchen with a dining area and a bathroom with a bath. A flat-screen TV is available. The holiday home offers a barbecue. Guests can go skiing or cycling or relax in the garden. First Ride is 6 km from Zion Cabin. The nearest airport is Reno-Tahoe International Airport 69 km from the accommodation.